I have worked ever since I was a junior or senior in high school in a variety of jobs. I have (to name a few) sold clothes, sold furniture, worked in a day care, sold tickets in a large arena box office, worked as a graduate assistant in a residence hall, answered late night calls to a women’s clothing catalogue call center, clerked through law school, waitressed, and worked as a receptionist in a nuclear waste incinerator facility, all while being a full-time student or in the breaks between semesters. The receptionist /​ other-tasks-that-no-one-else-was​-assigned-to-do job at the nuclear waste incinerator facility was intriguing. The facility was remote and so intentionally hidden that on my first day of work, I could not find it. Literally. I drove from interstate to paved roads, to gravel roads, and into the forest…waaaayyy into the forest…..and still didn’t see the entrance security gate. Even after I knew where it was, it was still hard to find. The summer that I worked there, the occasional protest group would appear (the smarter than average groups who could actually find the place) outside the gates chanting and waving signs. As the receptionist, I greeted international visitors from around the world….Germany, Japan, Sweden, England….and my job was to communicate as best I could in my Southern East Tennessee accent with persons who usually spoke very little English. I had to measure, record and hand them a dosimeter to wear on their lapel that measured radiation levels as they entered, then record their dosimeter reading when they left. I was never told what level would equal imminent death, but no one ever left glowing neon green under my watch. “Hot” was a term with specific meaning in this job. The incinerator facility required regular bio-assessment of its employees. Which is a fancy name for “here is a jug, please produce your urine for analysis.” After a while that became just like a scheduled coffee break. And, I never failed those tests. At least, I don’t think I did. We had a peculiar set of rules working there. The property had numerous large containers …the brightly colored kinds you see being transported on trucks on the interstate…royal blue, red, yellow, green…. all sitting stacked up around the property. Those containers held nuclear waste waiting to be incinerated or recycled in some fashion. And, painted on the pavement around those containers were three lines of different colors…..the colored line closest to the containers meant certain radiation exposure, and it lessened with each colored line being more distant from the containers. Theoretically, if you were outside the third most distant line, you weren’t being radiated. It was wildly absurd…you are fine here, but over there you die. Do not cross the wrong colored line! Walking around the property was a life or death version of hopscotch. And we were trained on how to decontaminate ourselves in case of emergency. And, there were procedures in place for how to handle an emergency, such as radiation being tracked into the office building. Which it was one day. Suddenly a spot in the carpet had been declared a “hot spot” and a hazmat crew came in full regalia of white hazmat suits, helmets, and breathing apparatus to cut out the carpet and scrub the concrete beneath it…say a 3 x 3 square….while the rest of us went about our business. They were in space gear and I was inches away in heels and pearls making copies. If you are over here, no problem, but if you just stepped in that square before the hazmat team came in, have you made peace with your Maker? But of all the jobs I had, it was routine waitressing where I stumbled across the line and accidentally exposed myself—–to self-inflicted humiliation. I took a waitressing job at Casa Gallardo, a Mexican restaurant on Bearden Hill in Knoxville. I was about nineteen years old and worked to help pay for the used car my parents had helped me buy during my sophomore year in college. The uniform consisted of the requisite off-the-shoulders white ruffled blouse tucked into a tiered ruffled skirt with a brightly colored orange and red sash tied at the waist. The menu was the typical tacos, flautas, rice, beans, and quesadillas. But, the menu also had a couple of “American” entries, namely a grilled chicken breast DINNER with rice and a grilled chicken breast SANDWICH. One evening a couple was seated in my section. I approached the table to take their order and their menus were closed in the center of the table. She ordered. Then he ordered. He said he wanted the grilled chicken breast. Yes, I said, which one? He said, again, the grilled chicken breast. Now, I was expecting him to say either the dinner or the sandwich. Yes, sir, which one? Again, he said the grilled chicken breast. Slightly impatient and exasperated, I said “Sir, we have TWO breasts here.” And, he quipped right back “Yes, I can see that.” I was suddenly very hot. I radiated heat, although not the nuclear kind. The pink flush of mortification flooded my chest and raced up my throat and into my cheeks. But, I did receive an excellent tip that night. I have become my mother. I mean, I knew I shared some traits with her, such as we look remarkably alike, or crying at Hallmark card commercials (I used to give her such grief…oh, boo hoo, here’s a card…and darn it if I don’t tear up now at those stupid commercials!) and saying some things to my children that are exactly like I just channeled her. But, honestly, I didn’t realize I had actually turned into my mom until I realized I too have a hate-hate relationship my electric can opener. When I was a young teenager and our house was decorated in avocado green and harvest gold with brown accents, Mom had an on-going antagonistic relationship with the electric can opener. I don’t know exactly what it did or didn’t do that aggravated her so much, but every time she went to use it a barrage of angry comments flew from her mouth. She would say “I hate this can opener! I swear one of these days I am going to throw it on the floor!” Eye roll from me and my sister. Yeah right, Mom. Like you are really ever going to do that. Shows what we knew. Our family room and kitchen were an open floor plan. One afternoon as we sat on the couch after school and Mom was in the kitchen making supper, we heard her grumbling at the can opener. Strange grinding noises came from it. Mom became louder in her comments. She was clearly cranking up into a dither. She had PMS….Pissed Mother Syndrome. And, then out of nowhere, she yelled “I HATE THIS DAMN CAN OPENER!” And with that exclamatory statement, she lifted that can opener over her head with both hands and chunked it to the kitchen floor with all her might. BAM! Metal clanged as the can opener crashed to the floor. The can opener lay dented and crumpled on our parquet floor and a piece or two fell off and scattered across the floor into the dark kitchen corners. My sister and I sat stunned on the couch looking at her in the kitchen. A friend of mine gave me a magnetic plaque that is on the side of my refrigerator that says “I only have a kitchen because it came with the house.” Truer words were never spoken. But, I do have to cook some (when Joel isn’t home) and that requires me to interact with various kitchen appliances, including the electric can opener. Several years ago, I gave away an electric can opener as a white elephant gift at a Sunday School party because it never quite worked. I thought that was the end of the electric can opener woes. But, no. When we moved into our current house six years ago, I needed a new electric can opener (because I had given away the other one), and I went to the bed and bath supply store and carefully perused all the models. I chose a bright, shiny, stainless steel electric can opener. It matched our stainless steel appliances and I had high hopes for it. As it turns out, it sat there mocking me. Pick me! I’m shiny and new! This can opener has NEVER worked. It won’t grab hold of the can without the stars and moon in proper alignment, and if it does grab the can, it turns exactly one rotation of the wheel before it chews up the lid and pops off. And, last but not least, it blows the kitchen fuse. Every. Single. Time. The fuse kicks off any appliance plugged in including the toaster oven, counter lamps and under-mounted lighting, and the phone and answering machine. If you have called our house and the answering message doesn’t come on, it is because the fuse blew that day and we haven’t had time to reset the machine. So, opening a can is maddening. By the time I press the fuse reset button multiple times, the kitchen is dark, the crinkled lid is still on the can, and I am red hot angry. And the can opener sits there just daring me to try it again. When the kitchen fuse blows, I blow my fuse. It isn’t pretty. But, before I could catch myself this past weekend, I actually yelled “I HATE THIS CAN OPENER AND I AM GOING TO THROW IT ON THE FLOOR ONE OF THESE DAYS!” And that is when I had a flashback to my mother standing in the kitchen looking at the mangled can opener on the floor with a self-satisfied smile across her face. I hope I can stop the awful cycle and not pass on this family trait to my daughter. But, it might be too late already. My sister, Cyndi, or as she is fondly known by her niece and nephews, Aunt Cyn-deeee, has always been a loving and integral part of our children’s lives. She and her partner Sharon have made time over the years to travel here from their home and do fun things with us and the kids, go on vacations with us, and to sometimes baby-sit for us. But, prior to having nephews and a niece, Cyndi had relatively little, if any, babysitting experience. We had three children in twenty months—fraternal twin boys and their sister twenty months later. Our lives thereafter took on the semi-feeling of raising triplets. Three in cribs, highchairs, diapers, car carriers, etc. and three who were all simultaneously dependent on adults for every last thing. It was like suddenly opening a daycare. Our house was stuffed and overflowing with swings, walkers, cribs, pack-n-plays, play mats, and multiple diaper changing stations throughout the house. So, Cyndi coming to our house to baby-sit alone when we had three in diapers was like throwing the novice swimmer who can only dog paddle into the ocean without a life vest. The dog paddle only lasts until the enormous swell takes you under. When Cyndi arrived to baby-sit by herself, Sarah Grace was only months old and the boys were about two years old. We tried, as best we could, in the middle of our bone numbing tiredness and the mental fog that had settled upon us since the boys’ birth, to think of every plan and routine, and where the essential supplies were—food, diapers, wipes, bottles, sippy cups, pacifiers – and every way to cope with what she might encounter, before leaving. We left believing we had covered every contingency. Have a great time, Aunt Cyndi! We love you! We came home a few hours later and sensed all was not well. Cyndi looked tired. Actually, tired would be a compliment. She looked haggard and more so than just a short stint with three little ones should have done to her. Cyndi looked like she had been crying and there were traces of tear tracks just barely noticeable in the blush on the apple of her cheeks. Are you okay? What is wrong? Weary and traumatized, Cyndi said that the boys had diarrhea most of the time we were gone. She changed poopy filled diapers continuously. And, gagged through all of it. Every last time. Cyndi was weak and wan from retching. Her novice nose wasn’t prepared for the onslaught. As she recounted the horrors of the ongoing and unrelenting poo, I happened to walk to the refrigerator to get a diet drink. As I opened the door, the large jug of prune juice was sitting a little more forward on the shelf than usual and it was a whole lot emptier than when I had last seen it. It never crossed our minds to warn her that prune juice in the sippy cups was a bad tactical decision. We thought everyone knew what prune juice was for and what it does to your system. Apparently, that would be everyone except Cyndi. Cyndi almost drowned in a sea of poop. A swell of self-inflicted, well, you know, s—. The Cat is Not Missing Nor Dead. At Least Not Until I Kill Him. In the Cook family soap opera called “Finding Forrest”, he has been found and we rejoice. Over the past few days I have called this cat a variety of names, none of which are complimentary. Stupid, ungrateful, malcontent, and feline delinquent are but a few of my thoughts. And, yet, when our neighbor Julie called to report a sighting, I was as happy as the children. The children flew out the door and caught him in the middle of the street and brought him home. Before tonight, Noah believed he was dead, but Sarah Grace, remaining hopeful, had said “I bet he found a girl kitty and fell in love.“ To which Samuel said dismissively “Nah. He had surgery to fix that and now he can’t fall in love anymore.“ Pessimist, optimist, and cynic. In the modern day equivalent of the party phone line, namely texts and Facebook postings across our neighborhood, his errant wanderings were first tracked up the street by our neighbor, Sara, to our more distant neighbors Robby and Jessica where he was given milk and affection for a couple of days (but they didn’t realize who he belonged to). Meanwhile, our neighbor Cindy called to check on whether he had come back and to empathize. Then tonight one of neighbors, Julie, called to say her husband, David, had just seen a black and grey striped cat with white feet running toward Pedro’s house. (And, to David’s credit, he openly admits he doesn’t even like cats!) And, during the kids’ neighborhood door to door canvassing yesterday, our neighbor, Judy, gave my children cold water to drink in the middle of a hot and humid day. Truly, it has taken a village, for which we are appreciative and grateful. For now, the prodigal cat is home. Does he have wanderlust? Only time will tell. If he lives that long. In light of a recent post I wrote entitled “The Cat is Dead”, it is with a mixture of disbelief and concern in between suppressed inappropriate giggles (you know, the kind of laughter that comes over you at a funeral or a somber moment and that you know is so wrong, but you can’t stop) that I now write to say that we fear our remaining cat, Forrest, has Run, Forrest, Run away. Or, perhaps has met a terrible fate in the woods next to our house. Noah put it best bluntly this afternoon, “It’s time to face facts, Mom. He’s dead.” Forrest hasn’t appeared in two or three days and there is no sign of his water or food being touched. We have canvassed the neighborhood this afternoon too. 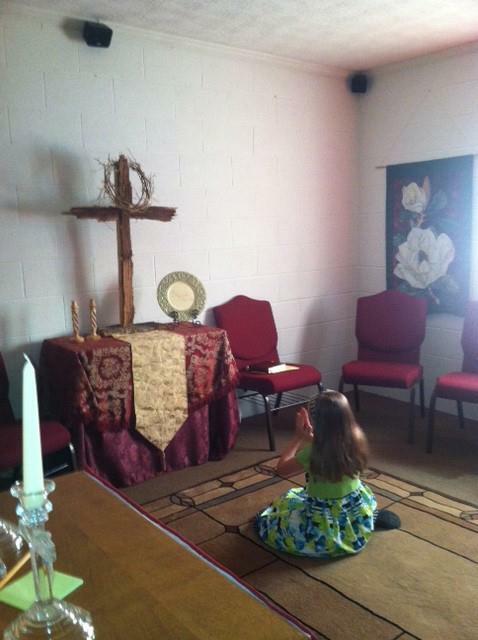 Our new church has a dedicated prayer room. And, this is only our second Sunday at the new church. But, Noah and Sarah Grace hopped out of the car and ran into the building ahead of me. I walked to the prayer room door and quietly opened it. Sarah Grace was alone and didn’t hear me. She was praying earnestly and I managed to snap a photo without her knowledge. The image I caught brought tears to my eyes. I walked away to give her privacy and peace. I met Noah coming down the hall on his way to the prayer room. Just then Sarah Grace exited and Noah slipped in. And, because I was curious, I managed to open the door as he prayed without disturbing him, and took a picture of him also. I posted the photos of them just before this post, so scroll down to see them. They are completely unstaged and they were unaware of my presence. If the cat never returns, it will be sad, but we will go on. But, the lesson my children taught me today will be forever imprinted in my mind and heart. They trust in God to hear their concerns, even if the answer isn’t given or isn’t the one that they hope for. We should bow down before God and have a personal relationship with Him. Shouldn’t we all have the faith of little children? Joel’s brother, Dale, is the younger brother by seventeen months. He is my favorite brother-in-law. (He wins that title by default since he is my only brother-in-law. But, I also really enjoy his company.) Joel and Dale, even in adulthood, have remained lovingly competitive with each other. Dale, although younger, married earlier in life and had children in his twenties. Joel was 31 when we married which is a long time to irritate your younger brother with opinions on topics you haven’t yet lived, including marriage and children. Joel, in our earlier days together, used to spontaneously spring gatherings upon me…always involving multiple people whom we would feed. He comes by the trait naturally as his mother can whip a meal for twenty together with no notice and graciously serve and entertain whoever appears in her house. Joel also loves to cook, and if you have ever come to our house you know he will feed you, and insist you eat seconds. When Joel and I were engaged, and our early August wedding date was “this close”, Joel had cancelled our appointments to find the tuxes for himself and the groomsmen several times at the last minute by unexpectedly inviting people to the house. (I lived in the house that he had bought just before he met me– he did not live there until after we married.) We had rescheduled our appointment AGAIN for early Saturday afternoon…. for THIS Saturday afternoon. And you know what is coming….yup, Joel sprung on me “I’ve invited my parents, sister and children, and brother, wife, and his family to lunch today. They’ll be here in a few minutes.” That would be nine people. I simmered. Lunch was delightful and my soon-to-be in-laws were good company. But, my eye was on the clock. That appointment had to be kept. But, as lunch wound down, Dale said to Joel “The hay needs to be put up. Can you help us today?” Joel, obliviously, said yes. Now I had to speak up. In a measured tone I said “No, Joel will not put up hay today. We have plans today.” The almost in-laws took a collective sharp breath and scarfed down their last bites. I closed the door as they scurried out the back porch door. As soon as the door closed, I really let loose. Hurricane Suzanne made landfall. I vaguely recall expressing that he could stand naked at the altar for all I cared at that point. And so on. This past Sunday was our first Sunday in our new church. In preparation for all the “new”…new people, new city, new denomination, new order of service, new architecture, and so on….I had been talking with the kids and covering the bases, or so I thought. So, with our best clothes and best behavior we walked up the front steps and into the sanctuary. The sanctuary’s colors are a beautiful and tasteful red and gold. The meet and greet with the children and myself went well. The congregation was warm and welcoming. We walked to the front of the sanctuary and sat on the second row. The service began. We were just a touch on display, both literally and figuratively. So much for first impressions….ours or theirs.